What keeps bringing us back to The Merchant of Venice? By some accounts, it is second only to Hamlet in frequency of performance. Perhaps its popularity lies in its timeless themes: cut-throat business dealings, the challenges of true love and religious conflict. The play tells the story of Antonio, the title merchant whose generosity to his friend Bassanio endangers his own life, and of the trials that threaten Bassanio’s marriage to the lovely heiress Portia. Their journeys through peril to triumph are the equal of any found in Shakespeare’s works. Antonio a loan with a fearsome collateral, fascinated audiences from the beginning. When Shakespeare’s company registered the play for publication in July 1598, in fact, they declared it “otherwise called The Jew of Venice.” Shylock is one of Shakespeare’s most complex and (particularly in our time) most controversial characters, a troubling figure who has held the stage for more than four centuries. Jewish characters had appeared in Elizabethan plays before The Merchant of Venice; perhaps because they had been banned from England since 1290, Jews made for convenient cardboard villains on stage. That is not to say that no real Jews lived in England, for small communities practiced their religion in secret. One of those Jews, a converted Portuguese doctor named Rodrigo Lopez, was executed in 1594 for allegedly plotting to poison Queen Elizabeth. This case brought back to the stage a five-year-old play, the late Christopher Marlowe’s The Jew of Malta, in which a cartoonishly evil Jewish villain poisons an entire convent of nuns before he is killed. Shakespeare may have been capitalizing on this play’s popularity when he wrote The Merchant of Venice, but he created a Jewish villain that was much more than a cartoon. Shakespeare borrowed his plot almost whole cloth from a 14th-century Italian book called Il Pecorone. Beyond the story, the very name of Venice would have conjured up specific associations in the Elizabethan mind: tremendous wealth generated from trade, well-ordered political and legal systems and tolerance for foreigners. In reality, however, Venice was far less tolerant, restricting its Jewish residents to enclosed neighborhoods it called “ghettos.” As with his Italian plays before and after, Shakespeare used Venice as a stand-in for London, commenting more on the personal conflicts generated in his city’s commercial interactions than on Italian religious persecution. But it was Shylock, whose anguish over losing his daughter and his money fuels his vengeful rage, that kept this play on stage almost continuously since its writing. The Irish actor Charles Macklin chose Shylock as his star vehicle in a 1741 production, playing him as a resolute villain. Edmund Kean, by contrast, created a much more sympathetic figure in 1814. After them late-19th century actor Henry Irving followed suit, the play all but became The Tragedy of Shylock, so much so that the other parts were edited down. 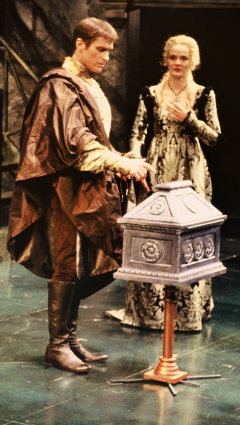 One production to restore the balance was John Barton’s 1978 Royal Shakespeare Company version, which featured Patrick Stewart as a memorable Shylock but also gave the other characters their due. Still, great actors have continued to engage with Shylock, including Dustin Hoffman in London in 1989 and Al Pacino on film in 2004 and on Broadway in 2010. This challenging and fiery play is unlikely to disappear from the stage in its next four centuries.